Do You Make Lighting Diagrams? You Should. I am not going to pretend like I am in-tune enough with the physics of light to draw up lighting diagrams BEFORE a shoot. However, with almost every single image I create I draw a lighting diagram, usually after the fact. It's one of the most important things you can do as a photographer who works with off camera flash. The process of lighting a shoot is fluid for me. It generally begins with a concept and a rough idea of how it will be lit. This is almost always just a jumping off point. The quality of light may not be how I imagined it, or there might be other factors influencing the light in a way that I didn't think of. So I adapt to the result that I am getting and make adjustments until I get what I want. Once I have an image that works with what my initial vision was, I take a few minutes to sketch a light diagram. A page out of one of my books of lighting diagrams and notes from projects past. I consider this a very important part of my process. It helps me analyze what worked, and frankly helps me remember how a shoot progressed. I often include notes about how the shoot went, where my light power levels were, what the sun position was (even if it didn't figure into my image). I also sometimes include stuff that should be included in the EXIF data, such as lens, camera body, etc. I do this because sometimes meta data gets stripped, or other bad things can happen and it takes only a second to write it down. I think most importantly I do it because I like having a visual record of my work (aside from the actual images) that has some technical behind the scenes information, and also I find it therapeutic to write them in a notebook. Like with a pen. Low-tech to be sure, but oh so satisfying. This is a practice that I recommend to any photographers, amateur or otherwise, who aren't in the habit of doing it. My notebook of choice is the Field Notes Brand 48 page Graph Paper Memo Book. I don't try to hide that I am obsessed with this brand. Mainly because they're wonderful, but also because they are small, so they fit in any bag. They are durable, and I adore the design sensibility and philosophy behind the brand. Field Notes. The best memo books around. So do you make lighting diagrams? If you don't, I think you should. It will help your creativity, critical thinking and possibly be a source of inspiration for future work. After my last semi-rant post about how geography impacts one's ability to be creative, I thought it would only make sense to follow it up with a post about accessing your analytical side, for the purposes of improving your process. For this post, I'm going to talk specifically about the Microsoft Office program Excel. If your goal is to work as a product photographer either full time or as a freelancer, chances are you are going to run into an Excel spreadsheet. It might be a printed hard copy, or a digital file, but it's still a spreadsheet. This spreadsheet will serve as your shot list, and hopefully contain everything you need to name your files according to what the production team needs. This can get a little old when shooting 50-75 samples in a day. But there is hope! 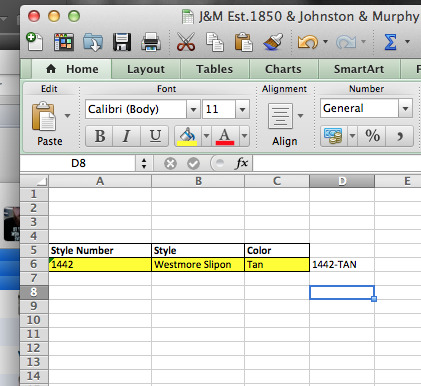 If you are willing to take a little time to learn how to use Excel and a few basic functions, you can make yourself a digital shot list, from which you can create your file names and copy and paste into your capture program (which for the purposes of this article is Capture One, and really thats what it should be anyway). We COULD type that in manually, or we could learn a quick formula to auto create our image names so we just have to copy and paste into Capture One. Basically Excel works with formulas that allow you to reference parts of the spreadsheet and use the content in the cell referenced. So what this formula does is takes the content of cell A6 (note the row and column designations) then with the "&" sign you are saying to add the following into the formula. You put your dash in quotes to show that you mean to add the text "-" and not a minus sign, then the content of cell C6 which is the color name. The result is the image name you need for Capture One. Now all thats left is to copy and paste the image name into the "Next Capture Naming" field in Capture One, and there you go. Over the course of the day, you will save yourself the time of manually typing AND your names will be accurate to your shot list, no typos. This might be a little over the head of a person who has no prior experience with Excel at all, in which case it would be worth checking out any number of Excel 101 tutorials online (like this one). Once you have your shot list with all your image names worked out, you can do a lot with the list to help manage your workflow and give you some insights into your workload on the fly. Hopefully this is helpful to some. If so, and if you'd be interested in more posts like this, send me a message, or leave a comment.